Out on the streets, Casey and Raph are beating down some purse-snatchers. As they trade wisecracks, Casey considers how his grades keep on slipping due to these late nights and he may lose his hockey scholarship. Going home, he finds his dad passed out with a bottle on the couch. Casey remembers how his Dad always treated him with “tough love” when he was little, but back then there was at least more “love” than “tough”. Casey goes to his room to study but falls asleep, instead. He wakes up a little while later to see a bookie named Blake Anders pressing his father (Arnie Jones) for the money he owes him. Arnie forks over a piece of his late wife’s jewelry (a golden, diamond-studded hockey stick) which gives him a 48 hour extension to find the rest of his debt. Flashback: Still a high school kid, Casey goes to see his ailing mother in the hospital. Casey tells her about his latest hockey win, though his dad wasn’t there to see it. Mrs. Jones congratulates him, weakly, and says he should grow his hair a little longer. Sixteen hours have passed since his dad’s debt extension and all the drunk has done is watch sports and bet more. Casey decides to go out and do something about it, getting in contact with Raph for an impromptu late night stalking session. They follow Blake to a pool hall called Skara Brae and take a seat in a booth. Blake and his thugs, meanwhile, are shaking down a patron for the money he owes. Flashback: At the hospital, Casey discusses his dad’s drunken and unreliable behavior with his mother. Casey calls him a stupid drunk, but Mrs. Jones says that Arnie only acts tough because he’s as scared of losing his wife as Casey is of losing his mother. Mrs. Jones makes Casey promise to take care of his father after she’s gone. At the pool hall, the patron (Matthew) loses his bet and Blake’s thugs take the poor guy out to the alley for a beat down. Casey and Raph intervene, knocking the thugs senseless. Casey (masked, of course) then tells Blake to leave both Matthew and Arnold Jones alone... or else. Blake recalls that Arnie's son was into hockey just as Casey knocks him out and retrieves his late mother’s jewelry. As they leave, Raph asks what the whole fight was about. Casey says that he’s simply keeping a promise. Flashback: At the hospital, Mrs. Jones tells Casey that strong people don’t have to act tough to prove how strong they are and that Casey should always remember that. Suddenly, Arnie comes through the door, soused. He lays his head onto his wife’s lap and apologizes through tears for being late to visit her. Casey returns home to find his dad in a drunken rampage. Casey tries to get by his dad to go to bed, but the drunk doesn’t like his son’s “smart moth” and begins smacking him around. Flashback: At the hospital, Mrs. Jones reminds Casey that his father isn’t as strong as he is; he needs to act tough in order to deal with his pain. She asks Casey to hide his inner strength from his father so that he can feel stronger. Casey promises to let his dad feel strong no matter what. Later that night, Casey comes hobbling back to the Second Time Around shop, where the Turtles are playing Twister to pass the time. He comes inside, battered and bruised. The Turtles ask him what’s going on and he says that his dad didn’t appreciate his “smart mouth”. Mike asks Casey if he’s going to be okay, but Casey (still clutching his mom’s old necklace) says that he’ll always be the stronger one. *This story is continued from TMNT (IDW) #12. The story continues in TMNT (IDW) #13. 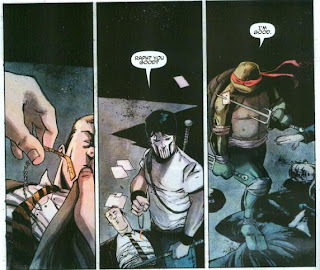 *Casey’s history, specifically background about his deadbeat dad and dead mother, was detailed in TMNT (IDW) #3. *This issue was originally published with 3 variant covers: Cover A by David Peterson, Cover B by Henderson and Herring, and Cover RI sketch version by Peterson. *This issue also contained a bonus pin-up by Henderson. Whew. Probably one of the heavier stories we’ve gotten in IDW’s TMNT run to date. Mike Costa is an author I only know by reputation, and that reputation is so heavily divided I’m not sure what to think. His work on IDW’s G.I. Joe series has been applauded by fans and critics and he’s absolutely loved for it. His work on IDW’s Transformers series, however, has been universally loathed on all fronts. I read his interview where he reflected on his time spent writing Transformers, claiming that he’s simply incapable of writing for “non-human” characters as he “cannot relate to them”. So the idea that he’d be writing a Teenage Mutant Ninja Turtles comic left me a little worried. But then I remembered it was the issue about their human friend, so I felt a little reassured. Worried? Reassured? Worried? Reassured? So many sensations! Honestly, the best thing to do is just read the freakin’ comic yourself and come to your own conclusion about its quality, regardless of what polarizing reputations the author may or may not have. Costa and Epstein pen a script that, in spirit, is very moving and tragic, but in execution is frustrating in how down-to-earth the conflict and characters really are. They basically flesh out the character exposition crudely delivered by Casey way back in TMNT #3, showing us all the details about his broken home that were glossed over as back story. It’s a sad and uncomfortable read, as there’s nothing fun about seeing a drunken father beat his son or a grieving family bid their loved one farewell on her hospital bed. But just because it isn’t “fun” doesn’t mean it isn’t good and that brings me back to the statement about how “heavy” this story is. 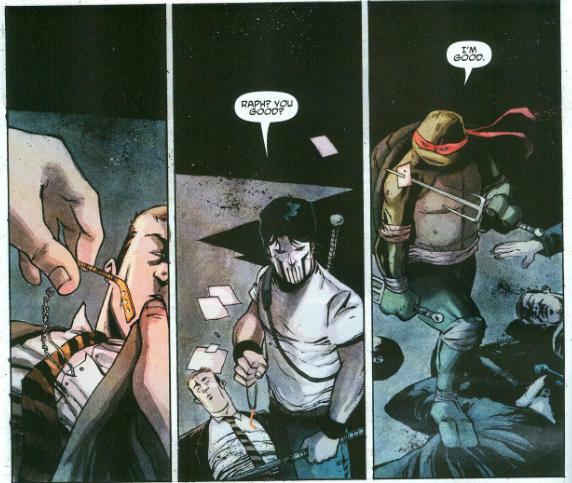 The closest contender is TMNT #5, which was very, very dark. And yet that story had an aura of hope about it, as it was a flashback and we already knew that things would turn out more or less “okay” for our heroes, as we knew they’d be reincarnated to fight another day and live beyond their tragedy. Casey’s future is far less certain and, well, far more relatable to a lot of us. I doubt many readers know what it feels like to be a reincarnated child from Feudal Japan, but how about losing a mother to a terrible illness or watching a once loving father destroy themselves with alcohol? That’s very human, very relatable and, from what I’ve read in interviews, something Costa excels at. Casey has problems and, for the most part, there are no clear answers. Even if trashing Blake cleared his father’s debt, it’s evident that the old man is going to keep on gambling. And there’s still the matter of Casey’s teetering college scholarship that’s only going to find itself in a more precarious position as he blows off studying to fight criminals. And how healthy is it to deal with the tragedy of his mother’s death by taking up a violent and potentially self-destructive pastime? There are no simple answers in this story and, in a way, that very closely reflects problems a lot of readers might have gone through (with or without a mutant turtle buddy). The character work in this issue is very strong, as even a monster like Arnie is given glimmers of humanity in the flashbacks or in Casey’s faded childhood memories. A potential speed bump in this issue for a lot of readers, I suspect, might be that there’s just no way out for anybody. Costa and Epstein offer no solutions for any of the conflicts presented, which isn’t so much frustrating in how it’s written, but frustrating in how we all can so easily relate to that most awful of feelings. Take, for instance, the conflict of the bookies. You can’t really stop a potentially mob-backed leg-breaker by beating him up and giving the name of the individual you want left alone. Especially when the bookie, getting beaten by a teenager with a hockey stick, knows that his target’s teenage son likes hockey. Casey’s “solution” is very much a teenager’s way of dealing with things with raw emotions rather than strategy and I suspect that there are going to be some big repercussions for his actions in this story. In comics, we see Superman punch Lex Luthor and then drop him off in the yard of a prison and accept that that problem is solved. 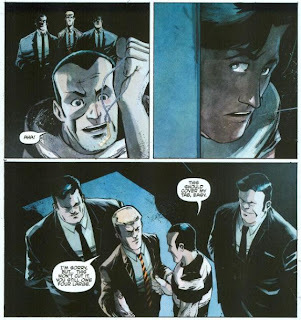 But in the real world, if you beat up a mobster and tell him to leave your dad alone, you’re going to end up escalating your problem to an even more frightening level. Then there’s Mrs. Jones’s downright awful and destructive deathbed advice to Casey. “Let your drunken dad feel strong by never standing up to him or defending yourself no matter what he does” (to paraphrase). That is a type of crippling psychological abuse on par with Arnie’s brutal and barbaric physical abuse. We spend the whole issue sniffling at the sad state of this kind woman, but at the 1 yard line she forces her son to make a promise like THAT? While I’d like to take it on faith that she meant well and never intended for her son to get beaten to a pulp by her husband on a daily basis, the story makes it perfectly clear that Arnie was a drunk and a child abuser long before his wife went ill (Casey recalls his dad bruising his ribs with slapshots when he was only nine). If you know that your husband is a violent drunk, how can you in good conscience make your son promise to “make him feel strong” by “never showing him how strong you really are”? Holy hell, woman. I hope that was just the morphine talking. Henderson and Herring pencil and color a visual masterpiece and this is one of the best-looking Microseries that IDW has put out. It’s dark and textured, fitting the grim and unpleasant atmosphere of the script. The second to last page, where the panels switch back and forth between Arnie crying on his wife’s deathbed and brutally backhanding his son is a hard thing to take in. 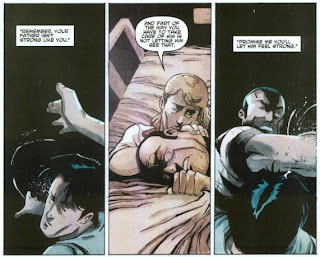 The last page, though, where Casey falls down in blood and bruises after his beating, but still smiling because he kept his promise to his mother… jeez. Contrary to what the surface might tell you, underneath it there just isn’t anything approaching an “uplifting” conclusion. Casey has basically trapped himself inside a cycle of violence and the longer he holds onto his mom’s necklace to remember his promise, the longer he’s going to get abused by his dad. It’s just really damn rough is what it is and the Henderson/Herring team sell it on all fronts. 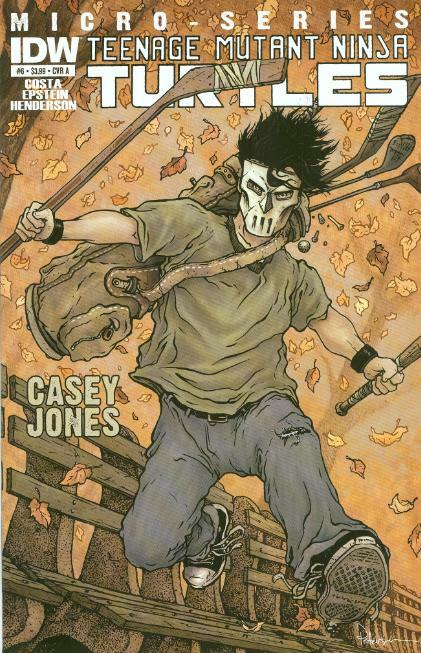 Microseries: Casey Jones is a difficult story to digest. It is in all ways very, very grey. You want to hate Arnie for beating his son and drinking so much, but then you’re confronted with memories of his better days as a father and shown evidence that he truly loved his wife. You want to weep for Mrs. Jones on her deathbed, but then you see her bind Casey to a promise that is killing him by degrees and you end up wondering how good a person she really was. Then there’s Casey, who plays the hero in the hockey mask but is in reality nothing more than a perpetual victim who cannot escape the violence he’s ensnared in; in fact, he’s only making things worse for himself and his father. There’s nothing easy about this issue; it’s very challenging. That isn’t to say that the readers who disliked it are “stupid” or “lazy” or “want simple stories”, but that I can understand feeling very uncomfortable with the story as presented and feeling rather blindsided by it, especially considering the far more by-the-numbers nature of the ongoing series. It’s a dark story full of awful people that have done good things and good people that have done awful things and if you aren’t in the mood for that kind of tale, well, it may leave you feeling very conflicted. I wouldn't want stories like this very often, as they're almost overwhelmingly bleak, but when they do come around they have a profound impact. Now that you mention it... I DID forget about the giant karate reptile near the end of this one! The depth they've given to IDW Casey is amazing. He is such a deep and real character. The fact that they can do a story like this about him is proof of that. I just hope his new family can knock some sense into him so that he can see what a destructive situation he's in. Let's not forget that this issue besides being brilliant incidentally gives an explanation to why Casey wears a retro hockey mask.